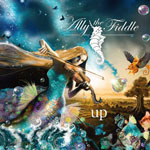 Share the post "Album review: ALLY THE FIDDLE – Up"
Think of rock fiddle players and you can probably name the significant on one hand. Jerry Goodman? Darryl Way? Jean-Luc Ponty? Female rock fiddle players may be more of a challenge. Anna Phoebe? Anne-Marie Calhoun? Following this rather tortured memory game, violinist Ally Storch fronts her own band and this is her second album. North Germany based, Ally’s violin permeates this album but not to the exclusion of her bandmates who enhance the necessary jazz metal quotient, especially guitarist Robert Klawonn. The lively (and heavy) opener ‘Sisyphos’ also features vocals but mainly this is instrumental fusion music with metal flavours. Ally even finds time to include an excellent (bonus) version of ‘Surfing With The Alien’ whilst the legendary Jerry Goodman actually appears on one track ‘Try To Stop Me’. This adds great credibility to an excellent second outing where the classically trained violinist eschews the modern trappings of synthesisers and keyboards to achieve a more organic sound. One of the highlights, though, is the attractive ‘Entering Stratosphere’ with simple chiming guitar figures topped by Storch’s demonstrative strings. This entry was posted in ALBUM REVIEWS, ALBUM REVIEWS (Mobile), All Posts and tagged album, Ally Storch, Ally The Fiddle, fusion, instrumental, Jazz rock, Jerry Goodman, metal, progressive, review, Up, violin. Bookmark the permalink.